Some time before the holidays last year, I began communicating with another long-term childhood cancer survivor from the UK. Many of our similarities are uncanny, in fact they seem like serendipity, i.e., the faculty or phenomenon of finding valuable or agreeable things not sought for! 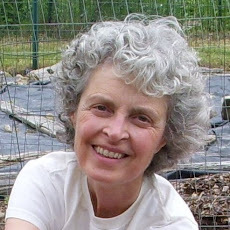 Here is her "cancer victory garden" story. 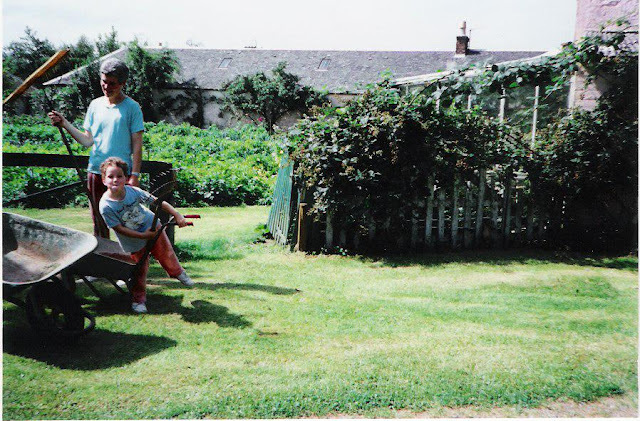 As a fellow neuroblastoma survivor, but from Scotland, I am amazed to see how Diana and I have traveled very different roads but hold very similar views on food and gardening. I also had neuroblastoma at a very young age, at 18months-in the late 1950's, and was given a series of terminal diagnoses, but recovered after very extensive surgery and radiotherapy. As a child I was brought up eating a lot of vegetables that my father grew himself, which always included kale, seen as an essential ingredient in my mother's delicious home made soup. As a teenager I became vegetarian, for ethical reasons at the time, and read a lot on nutrition, dipping into naturopathic books. At age 20, I was doing voluntary work at a holiday home for disabled people in England when I was given a copy of 'The Vegan' magazine, and in it found an advert which stated a free organic gardening course was being set up at a major naturopathic clinic near London, food and accommodation would be provided. I had never heard of 'organic' gardening, nor had anyone I asked, but the course sounded interesting so I wrote off and was invited to join up. As it turned out, I was the only student enlisted, and the course never actually started (! ), but I worked in a lovely walled garden, from which vegetables were provided for the clinic. I also enjoyed meeting many of the fascinating professionals working at the clinic. To top it off, all meals were provided, and they were delicious vegetarian gourmet food to me. I did get a lot of experience working in the garden. There were some gardeners there who did teach me some organic practices, and I remember I even spent my 21st birthday planting out rows of young plants. I had not told anybody there it was my birthday, and family and friends were far away, and I really had no money at all at the time. I even remember picking bags of nettles after work to cook up myself to keep me going until meal time. There were vegans and many vegetarians amongst the staff, and knowing nothing of my past medical history, they took me under their wing as their youngest staff member and instilled in me the importance of fruit and vegetables, whole foods and the confirmation that meat was not necessary in my diet. After a few months in this garden, I heard about a young couple in the South of Ireland who had set up an organic smallholding and needed help. I was offerred a lift part of the way, so I worked there for a few months, learning more from them. I settled down to a more conventional life after this, going to university, getting a nursing degree, becoming a midwife and district nurse. I always ate differently from others though as I ate a lot of seeds, grains, loads of raw vegetables, and a very high percentage of my diet as fruit and veg. When I did marry and get a garden, one of the first things we did was to make a vegetable patch and grow kale and rhubarb. My children helped plant seeds and weed, and we tried a variety of fruit and vegetables each year. Our biggest success was a 10 year old packet of tomato seeds, which I thought I might as well try rather than just throw away. My daughter sowed them with a new packet, but it was the old variety that produced a huge number of plants, enough to give away to neighbours, and then such a big harvest of outdoor tomatoes that we were still eating them 6 months later. My father kept a 1 acre vegetable garden himself until he was 92, so I have had a lot of good family examples plus a lot to live up to! I am convinced my diet and exercise has played a large part in the health I have today. Saying this, I did discover a lump in my breast at age 50 which turned out to be breast cancer, but the radiotherapy I had to that side of the chest as a very young child put me at very very high risk of this. I feel sure my diet gave me extra decades before this happened, and luckily I caught it at an early stage. Despite having had radiotherapy to the left side of the chest as a very young child, I am still very fit and have an active job as a nurse, and have two beautiful strong healthy daughters. Since learning about the increased risk of late effects such as breast cancer for female childhood cancer survivors who received radiation to the chest as part of the childhood cancer treatment, I have been trying to work in this country to raise awareness of these issues along with the importance of diet and exercise for reducing the risk of cancer and even late effects such as heart disease. I was immensely impressed when I came across Diana's blogs and website and saw all she had set up on these topics already. I was honoured when she asked me to share my story of my gardening and the many ways I have both enjoyed it and likely benefited from it. Thanks Diana! Thank you, thank you for sharing your own "Cancer Victory Garden" from Scotland. Your journey is so inspirational that it brings tears of happiness and joy to my eyes. Not only do you have quite a lot of years to "live up to" as you stated in regards to your father's garden, but you have decades of gardening ahead of you to enjoy. I have no doubts that your ultra-healthy diet not only gave you a long span of time between the radiation treatment for your neuroblastoma, it also likely gave you a better prognosis after the diagnosis. Please keep spreading the word in the UK and Europe as you advocate for healthy lifestyles for both cancer prevention and cancer survivorship. We all want to live as well as possible as long as possible. With your dedication to these ideas, and using gardening as one activity to promote these healthy lifestyles, you will make a difference in the lives of many, many people. I'm going to end with one of my favorite quotations. It just reminds me of you Caroline! and to eat and sleep with the earth. You are the embodiment of the "tag line" of this blog. Now I know I just need to get back to visit Scotland again. :-) Until then, I'm sending you a cyberhug! Here is the final update from the 2010 Cancer Victory Garden at the Trinitas Cancer Center in Elizabeth, NJ! Regretfully, we got word that we can't use the courtyard at Trinitas for gardening--at least for this year. However, the good news is that I'll be doing another indoor garden next year, and the complementary medicine RN will work on starting a healing garden at that time. At least this got the ball rolling! I did distribute the plants as I was getting so many requests for the plants (mostly the cilantro). I wound up putting them in the plastic cups primarily to save the cost of individual planters. Each plant had a label on its cup stating what the plant was, along with strict instructions to re-pot into a container with drainage. I even sent an email out to the staff the next day to remind them to re-pot the plants. I also included info about how some of the herbs can be used plus a recipe for taboulleh to use the parsley). Even employees that I didn't know very well were stopping by and asking for a plant. It was quite a social event for the patients as well. Here's my final pictures to you of our 2010 Cancer Victory Garden. Good luck on all your exciting endeavors. All those plants going to a new home with love. Thanks for sharing your love for good food and nutrition with your cancer community, showing everyone that it all starts with "nutrition from the ground up". I'm going to end with a short poem by one of my favorite writers, a farmer-poet-philosopher, Wendell Berry. His words speak to and reinforce Cheryl's efforts to cultivate her community within her own cancer center, which is so important for both the people coming there for care and hope and also for the people providing that hope through their professional care and caring. its soil, forests, grasslands, plants and animals, water, light, and air. each is the other's hope of a durable and livable life." Please keep us informed next year when your indoor gardens begin again and your cancer center's courtyard gets an update and new life added to it! How fortunate the Trinitas Cancer Center is to have this new annual tradition to look forward to and participate in!